Well the year 2002 is just a few hours away. I can't make up my mind whether 2001 either flew by or was dragged along by its feet kicking and screaming. I've got a feeling 2002 is gonna be a db chock full kinda year. On the 5th FEBRUARY David and Iman were guests for the premiere of the new Ridley Scott movie 'Hannibal' at the Ziegfeld Theatre, in New York City. Other guests included Anthony Hopkins, Emma Thompson, Giancarlo Giannini, Julianne Moore, James Wood, Teri Hatcher, Lauren Bacall and Muhammad Ali. The Rat and Parrot, formerly the Three Tuns, in Beckenham High Street was shortlisted for a top historic landmark award. It was one of ten finalists in BBC History Magazine doomsday project. The project is a nationwide search for historic landmarks local people think should be saved for future generations, recorded in some way or simply given the recognition they deserve. The Three Tuns finally came in 2nd place behind Reading British School, Berkshire. The 23rd saw a live David Bowie performance at the Tibet House US Benefit Concert in Carnegie Hall, New York City. His band line-up was Philip Glass on keyboards, Moby on guitar, Tony Visconti on bass and Sterling Campbell on drums. He performed two songs 'Silly Boy Blue' and "Heroes" and joined in the encore of 'People Got The Power' with Patti Smith et al. MARCH 2nd David Bowie laid down his 'Nature Boy' vocals in NYC with Tony Visconti for the Baz Luhrmann highly successful movie 'Moulin Rouge'. Two excellent versions of the song appeared on the soundtrack. Massive Attack's Robert '3D' Del Naja produced a version in London. David made a surprise TV appearance on BBC2's Omnibus documentary, 'Resurrecting Stanley'. He narrated the arts documentary on British artist Stanley Spencer and bloody good he was too. David featured on the cover of UK's 'Uncut' magazine (April issue) along with an exclusive 'Bowie In Berlin'. David and Tony Visconti duly supplied their exclusively written material for this special feature the previous month - only to find it cut up and edited when published. If you want to read the PROPER and CORRECT versions of what both of them said click here David Bowie and Tony Visconti. On the 27th a David Bowie Audio Biography CD was released on the Chrome Dreams label and apart from the packaging it was dire. Sadly David's mother 'Peggy' (Margaret Mary Jones) past away on the 2nd APRIL aged 88. 'We reinvented culture the way we wanted it - with great big shoes' - David Bowie remembers glam. David writes the foreword of Mick Rock's excellent publication 'Blood & Glitter: An Eyewitness Account'. David records his amazing and quite brilliant version of the classic Pete Townshend penned song 'Pictures Of Lily' for the Who tribute album, with himself and Mark Plati producing. 14th MAY Moulin Rouge soundtrack gets released on the Uni/Interscope label featuring 2 different Bowie versions of 'Nature Boy' along with Beck's version of 'Diamond Dogs'. Genesis Publications invited you to a pre-publication preview of the forthcoming book 'Moonage Daydream: The Life and Times of Ziggy Stardust' due for publication in June 2002 to mark the 30th Anniversary of this legendary classic album. After the success of 'Life On Mars?' used on the French television commercial for LA Post (the French Post Office), the single was re-released by EMI in France. David made a visit to CBGB's Gallery on May 15th to see singer Kristeen Young who appears on some of David's recent studio work and also earlier caught Icelandic 4 piece band Sigur Ros at their Irving Plaza gig in New York City. David Bowie came out top in a Virgin poll as the 'Greatest Rock Star' over the age of 50 with Rolling Stones star Mick Jagger coming second. I said it then and I'll say it again... We already know David is, was, and always will be, the great rock star ever at whatever age he happens to be. After a month delay 'Substitute - The Songs Of The Who' is released on the 4th JUNE by Edel featuring David's own version 'Pictures Of Lily'. David said: "The Who's work became a major template for so many of us. The considered and intelligent use of so-called 'art-theory', actively engaged with rock music, was merely one of Pete's phenomenally important contributions to the new 'language' of rock. Nice trousers too!" And not only that, a special 4 track promo CD single of the Who tribute album was available for free - if you cut out the coupon in The Daily Telegraph newspaper and ran along to your local Virgin Record store. The coupon said you could obtain one for free... or disguise yourself sufficiently enough to keep going back in and out of the shop for a dozen or so. Oh the hats, overcoats and sunglasses I went through! ;) I shouldn't really be telling us this but... doesn't life bring out the strangest of coincidences when you go along for your free CD and the Virgin girl behind the counter is someone you've known for the last 15 years... and still desperately fancies you :) One cup of a coffee and a peck on the cheek later = 25 CDs... good deal huh. The 5th finally saw The Rustic Overtones, after record label problems finally get around to releasing their album 'Viva Neuva' on the Tommy Boy label, which features David Bowie on two tracks 'Man Without A Mouth' and 'Sector Z', with Tony Visconti producing. JULY sees David Bowie begin a two-part series that tells the fascinating history of Soho's Marquee club, one of the most famous music venues in the world. Broadcast on Radio Two on 14th and 21st July. 'All Saints' was released on the 23rd featuring sixteen all instrumental songs recorded by between 1977 and 1999. Originally compiled by David for a 2CD Christmas present for friends back in 1993, the album was reconfigured into a single disc and newly created artwork produced by David himself. The Sunday Times voted it as their 'Record Of The Week' along with the soundtrack to Christiane F which was released in CD format. David records 'American Dream' with Sean Combs, P. Diddy aka Puff Daddy at his Times Square studios for the soundtrack of the upcoming movie 'Training Day'. David, Snoop Dogg and B.B. King all fall from the sky and land in the oddest places in TBWA/Chiat/Day's first work for XM Satellite Radio. David's commercial features part of the track 'Afraid'. July 26th photograph session for Vanity Fair magazine. The cover shot was photographed exclusively for Vanity Fair by Annie Leibovitz in New York City and for those of you fashion conscientious fans out there, David was wearing clothing by Alexander McQueen from Jeffrey, NYC. The magazine was published later in October. The fold out front cover portrayed Jewel, Beyonc� Knowles, Beck, David Bowie, Joni Mitchell, Stevie Wonder, Maxwell, Emmylou Harris, Gwen Stefani, Jay-Z, Missy 'Misdemeandor' Elliott and Chris Cornell. AUGUST sees the Edinburgh Fringe Festival go slightly Bowie crazy with Des De Moor's cabaret tribute show 'Darkness and Disgrace' which went down really well and Adrian Berry's 'From Ibiza To The Norfolk Broads' play which was excellent. The Beckenham Town Centre Residents Association start planning to celebrate and recognise David Bowie's association with their town where he lived for almost five years between 1969 and 1973. Virtuoso keyboardist Jordan Rudess plays on David's new album. The sessions took place in late August at a studio in the Catskill Mountains, New York (Glen Tonche Studios). In SEPTEMBER Absolut Vodka start sending out a 45 'record' invite of David Bowie's Aladdin Sane album cover, with a tiny vodka bottle replacing the teardrop on his shoulder. 'Absolut Bowie' is part of the latest US advertising campaign 'Absolut Album Covers' from the Swedish vodka company. The movie Zoolander which features a cameo by David gets its release during September. David said of the movie: "The script is hilarious... "there is a 'fight-club' style 'walk-off' between the two star models and I act as the ref." 'Training Day' soundtrack is released in the USA featuring P. Diddy and the Bad Boy Family featuring David Bowie: 'American Dream'. Guitarist David Torn starts recording with David for a new album to be produced by Tony Visconti. 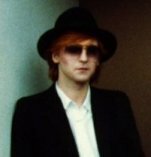 OCTOBER sees Boy George winning in a celeb version of 'Stars In Their Eyes' as 'David Bowie' - and boy wasn't he chuffed about it. David and a host of leading London artists design 2001 Christmas cards for the Aids charity Crusaid. All the money raised will go towards helping fund Aids care, support and research around the world. David's card was a portrait of his baby daughter Alexandria's hand. David is recording the new album at Glen Tonche Studios in the US. Commenting on the new album he said: "I feel we've touched on things musically that we never could have accomplished those many years ago and I know we're going to be quite proud of this album." In Pete Townshend's diaries from 19th October he mentions that after rehearsals he went to see David at a studio and was asked to work on a track off David's new album. David played Pete a number of tracks, he said that it was "surprising, moving, poetic (in a musical and visionary sense). I think real Bowie fans (and a few of Radiohead) will be able to walk tall soon in the knowledge that their hero can still break all the rules and remain cool." David opens the benefit 'Concert for New York City' on the 20th at Madison Square Garden. Amazingly he performs Paul Simon's 'America' sat cross legged on the floor playing an Omnichord. He said inbetween songs: "Thank you very much. Hi friends. Hi fellow New Yorkers. I'd particularly like to say hello to the folks from my local ladder. You know where you are. I must say it's an absolute privilege to play for you tonight. Without further more adieu"... Then David and the band went into an excellent version of "Heroes". The stage lighting behind David had banks of vertical white lights, not too dissimilar from his 1976 and 1978 World tours. He then left the stage with: "Thank you. Have a great evening." David was able to get both Gail Ann Dorsey and Mark Plati involved, along with Tony Visconti in the sound truck to oversee David's part of the show. The Concert for New York City event was to raise money for the Twin Towers Fund. Thousands of members of New York's fire department, police department and rescue crews were invited to attend the show along with their families. A 2CD set was released on November 27th by Columbia Records. Film maker Albert Maysles is currently working on a documentary of the event to be released around July 2002. In his BowieNet journal from the 21st, David let's slip that he's planning on touring in 2002. He also went on to mention that the new recordings have by been performed in the main by: Matt Chamberlain on drums, Tony Visconti on bass and some other things (including recorders), David Torn on guitar and the 'Scorchio Quartet' (led by Martha Mooke). He also said he has "played probably more on this album than any other that I've done since 'Diamond Dogs' or maybe 'Low'." And then to top all that, another surprise was that Carlos Alomar came over and played rhythm guitar on a couple of tracks. On the BowieNet message boards David answered a question about the release of 'Toy'... "As I have said before, Virgin/EMI have had scheduling problems and are now going for an album of 'new' material over the TOY album. Fine by me. I'm EXTREMELY happy with the new stuff (I love Toy as well and won't let that material fade away). If you've been following the newspapers you will have seen that EMI/Virgin are having major problems themselves. This has not helped. But all things pass." And later he commented further: "I won't let TOY slide away. I am working on a way that you'll be able to get the songs next year as well as the newie." During NOVEMBER David contributed his vocal talents for Lou Reed's next album 'POE-try', a 2-CD soundtrack to his musical theatre collaboration with Robert Wilson. The project is based on the work of Edgar Allen Poe and while Willem Dafoe recites most of Wilson's text, Lou Reed has contributed thirteen new songs. The track featuring David's lead vocals is entitled 'Hopfrog'. Iman published her first ever book 'I Am Iman'. A promotional 5 track compilation CD made up of Bowie tracks were hand selected by David himself to celebrate the new book. Bowieart.com again sponsored the RCA Secret exhibition at the Royal College of Art in London, with David submitting artwork. The secret db piece eventually turned out to be piece number 1376. David made an appearance in a new Pixies documentary 'Gouge' which was broadcast by Channel 4. The documentary looked at how the influential US band the Pixies redefined rock music in the 90s. Featuring rare footage of their first London gig in 1988, and contributions from David Bowie, U2, Radiohead, PJ Harvey, Badly Drawn Boy and Blur. On the 29th David was confirmed to play next year's Tibet House Benefit Concert next February 22nd 2002 in the Isaac Stern Auditorium at Carnegie Hall in New York City, USA. The sold out show will also feature Philip Glass and the Kronos Quartet. During DECEMBER David got erected on the 6th with a Bowie Plaque handsomely placed on the wall outside The Three Tuns in Beckenham to celebrate and honour The Arts Lab he set up in 1969. Monies raised from the event so far has reached £909.69, which went to The Chernobyl Children Lifeline Charity. 15th December and the most important Bowie announcement of the year... 'David leaves Virgin Records'. He has taken the unprecedented step for an artist of his standing and decided not to re-sign with his record company, Virgin Records, choosing instead, to create his own small, independent label ISO. On the Thursday morning Bowie's business representatives, RZO, sent a letter to Virgin Records stating that "We respectfully decline your attempts to negotiate a new contract in light of the missed option pick-up of a year ago." On taking the whole recording and marketing process into his own hands Bowie commented "I've had one too many years of bumping heads with corporate structure. Many times I've not been in agreement with how things are done and as a writer of some proliferation, frustrated at how slow and lumbering it all is. I've dreamed of embarking on my own set-up for such a long time and now is the perfect opportunity." David Bowie's label ISO, which was registered as a record label over a year ago, will be based out of New York and London and has already signed two new artists, one solo and one band. Bowie and Visconti have also recently moved their projects into their own recording studio in Manhattan, New York, in anticipation of this new departure. Said Bowie, "I want to keep the whole experience at a human level. To characterize ISO, I think I would use guitarist Robert Fripp's phrase and describe it as aiming to be 'a small, mobile, intelligent unit'." David Bowie was able to make this bold step as a result of an overlooked option in his previous deal with Virgin Records. After you've stood outside on the door step in the freezing cold with a lump of coal, a piece of bread and a quid in your pocket whilst the missus finally opens the door to let you 'let the new year in' you can rush over to the TV, tune into ITV at 5 minutes past midnight and watch Iman in the excellent movie 'No Way Out' with that Kevin Costner bloke. Have a Happy New Year everyone! Here's to 2002.